This has been my community-driven project. Thank you to all of the Beta/RC testers that have provided feedback. I'll state what has changed from Easyminer 2.0 and then state what the plans are for this miner in 2018. • Totally overhauled UI. In fact the new Easyminer was written from the ground-up as a direct replacement for the existing Easyminer, based off of feedback from the old version as well as feedback throughout. • Now have to manually install Electrum-GRS if you want to automatically have the address come over. This is to prevent previous issues of the packaged version becoming out of date. Don't worry, a quick-start guide will open on first-launch with instructions! (More on this later). • The previous version, when using Dwarfpool, pointed you to the Canadian pool, regardless of where you were. This version will see which pool (CA/EU) has the best latency and use that one instead. • Uses 2 different detection methods to try and automatically select the correct GPU. If it detects incorrectly, the user can manually change the options of what to mine with. Please note some people have had issues starting the miner due to a SlimDX issue. If you get an error when launching, please go to here: https://slimdx.org/download.php and download/install the .Net 4.0 x86 download. • Can now mine with CPU AND GPU if required. You are now more in control than ever. • Better log integration in the app. Now multi-line for nVidia and CPU which are logged directly in the app (AMD is currently launched separately in a command window still). • More reliable Electrum address finding. Previously was using an external .VB script which run on launch, this is now done entirely within code and should be more reliable (Had reports of the wrong address appearing on the previous version). • Added an 'About' screen with site address, donation address, reddit page etc. • On first launch, a setup screen will appear to guide and help the user. Can access this again if Electrum-GRS is not set up by using the 'Reset Wallet' button. 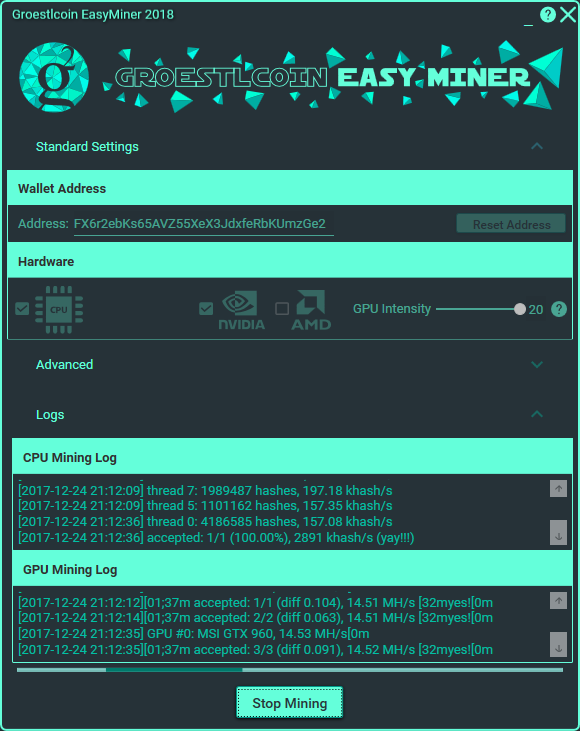 • Updated nVidia miner - Uses a new version of ccminer which seems faster for Groestlcoin and allows intensity settings. • Added donation tab for donating to development and marketing funds. Although our applications are safely used by thousands of people, you may get a false positive detection from your antivirus. False positive detections are common in the antivirus industry. They occur when a benign program is wrongfully flagged as malicious due to an overly broad detection signature or algorithm used in an antivirus product.